kneel on one knee at his or her head. Pass your hands under the armpits; then slide your hands down the sides and clasp them across the back. 2. Raise the casualty to the kneeling position as shown in figure 4-85B. Take a better hold across the back. 3. Raise the casualty to a standing position and place your right leg between the legs, as shown in figure 4-85C. Grasp the right wrist in your left hand and swing the arm around the back of your neck and down your left shoulder. 4. Stoop quickly and pull the casualty across your shoulders and, at the same time, put your right arm between the legs, as shown in figure 4-85D. 5. Grasp the right wrist with your right hand and straighten up, as shown in figure 4-85E. TIED-HANDS CRAWL. The tied-hands crawl, shown in figure 4-86, may be used to drag an unconscious person for a short distance. It is particularly useful when you must crawl underneath a low structure, but it is the least desirable because the victims head is not supported. 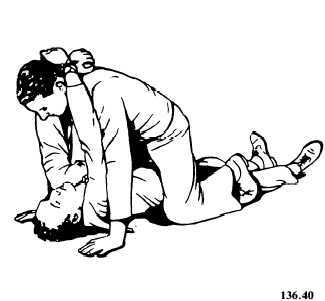 To be carried by this method, the casualty must be in the supine position. Cross the wrists and tie them together. Kneel astride the casualty and lift the arms over your head so that the wrists are at the back of your neck. When you crawl forward, raise your shoulders high enough so that the casualtys head will not bump against the deck. BLANKET DRAG. The blanket drag, shown in figure 4-87, can be used to move a person who, due to the severity of the injury, should not be lifted or carried by one person alone. Place the casualty in the supine position on a blanket and pull the blanket along the floor or deck. Always pull the casualty head first, with the head and shoulders slightly raised, so that the head will not bump against the deck. 1. Place the casualty in a supine position. 2. Lie down on your side along the casualtys uninjured or less injured side. Your shoulder should be next to the casualtys armpit. 3. Pull the casualtys far leg over your own, holding it there if necessary.